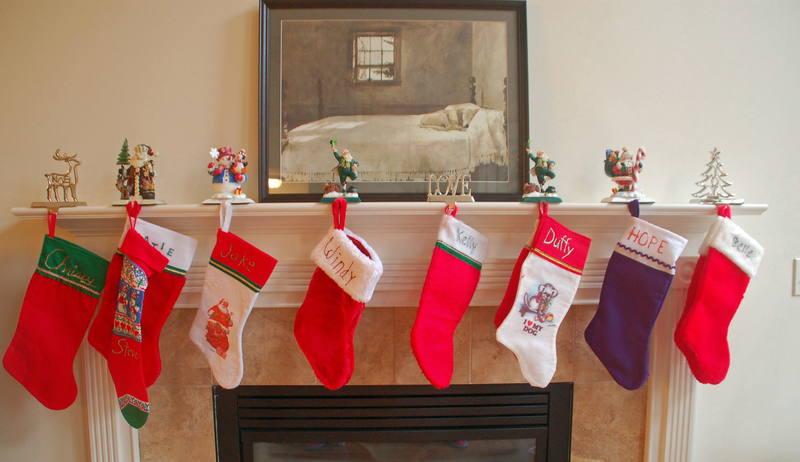 Every dog has a stocking. Above our fireplace hangs "Master Bedroom" by Andrew Wyeth. We love the mood and warmth the work shows. Many studies indicate that the vast majority of dog owners buy their furkids presents. We are no exception. Dogs do have their needs – food, medicine and love – and we have our “wants” for our dogs – toys, comfy beds and snacks. The pet industry knows this and is more than willing to accommodate everyone. We put presents in our dogs’ Christmas stockings. We have a tradition of making a sock for each dog. When we lose a little one to the Rainbow Bridge (http://www.petloss.com/rainbowbridge.htm), we still hang that sock. Yes, it can be sad at times hanging socks for the angel dogs, but we try to focus on the good times. Even though it has been almost three months since we lost Hope, our hearts are still heavy. Some times I still want to call her to dinner. On another note, getting ready for the holidays can be fun for you and your dog. I have friends who send cards from their dogs (and cats), dress them like Santas or reindeer and bake dog biscuits. I like to bake cookies for humans. Anyone know where I can get a dachshund cookie cutter? This entry was posted in Christmas, Dachshunds, Dog Accessories, Dog Behavior, Dog Toys and tagged Dachshunds, Dog Behavior. Bookmark the permalink.